Even walkers can take workout selfies, just like runners. I finally live in a town with sidewalks, and I have plenty of extra time during the summer, so, naturally, I have taken up the practice of walking 2-4 times a week. In the last month, I have walked a total of 30.4 miles over 8 hours and 19 minutes, burning 3,109 calories. You guys, I’m so pumped. I feel really good about this. I bought new clothes and everything. The problem is that I can’t brag about it because I’m walking, not running. If I was a runner, it would go all, “Oh hey, I’m thinking of going for a run later. Do you think this rain will let up in time?” “Oh, you’re a runner? No kidding! Me, too. Are you doing the 5K for the Fourth of July? Let’s exchange routes and our favorite warm-up stretches.” And we would be great friends and have mutual respect for one another. So in this world, the only work-outs worth bragging about are yoga, running, and weight lifting. (Don’t believe me? Check Instagram.) Everyone else is not cool and pregnant. I want to live in a world where walkers and runners get mutual respect. I want to live in a world where I can say, “I’m getting my walk on. #workout #fitspo #business” and I will be the envy of everyone sitting on his or her couch instead of moving. I want to inspire, and proudly brag about my workouts without reserve. I want that world! And so I say to all you walkers out there: Rise up! Stand proud and declare your love of walking and that this is a totally legitimate and serious exercise. Spread the word! And get stepping! You are just as worthy as those runners. 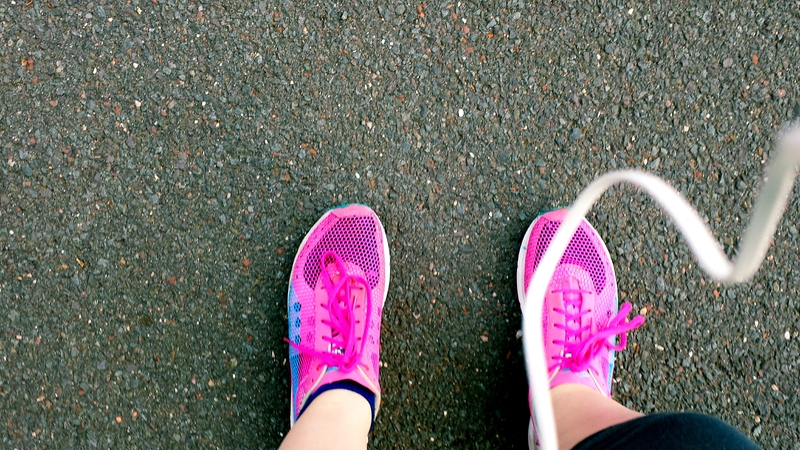 Don’t ever look down at your feet, moving at a pace of 4 mph or slower. Walk on, little feet. Walk on. Just to drive home my point that walking is just as good as running, let’s do a little side-by-side. So, runners do tend to lose weight faster, and can get a medal for running a marathon (There are also a lot of reasons not to run a marathon.). But is that really worth it? Is that really enough to totally make us walkers feel like lame losers? At least walkers have something in common with their grandparents! So that’s all I need. Running is painful and stupid. And you get cramps and want to throw up. Walking is beautiful and it rocks! Start the movement! Walkers, arise! WALKED to the Elementary school yesterday from Gpa’s house! Yeah me! Respect the WALK-ON!